Conched Out - A 5bed/4bath luxury home situated on a plush 2.2 acre estate with breath taking sunset views. Conched Out is located on the Island of Elbow Cay part of the Abaco Islands in the Bahamas. Great Room : Open concept room with soaring 20 foot ceilings featuring dining, living and kitchen areas. Walls are cypress with a whitewash finish and Italian ceramic tile is featured throughout the house. 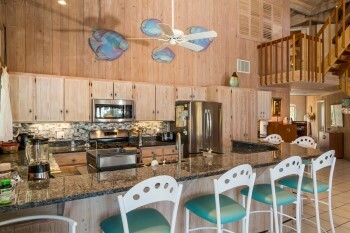 The kitchen faces the sea and is well equipped with a gas stove, microwave, juicer, dishwasher, coffee maker etc. Other features include Central AC, Satellite TV, VCR, Sound system with CD player, tape deck and speakers on main floor and top floor cupola, VHF radio, phone, gas BBQ, free WIFI, desalination plant and stand-by back up generator. A laundry room with washer and dryer is attached to the house and is available to all guests. Bedrooms : 5 Bedrooms, 3 on the main floor and 2 dormer bedrooms on the second floor. The Master and second bedroom are off of the Foyer and the Guest Bedroom is off of the living area. Partial view, features high cathedral ceiling, Queen size bed, large sitting area, working desk, walk in closets, 6 piece bath including Jacuzzi. Sliding doors open to a deck overlooking the sea. Connects to a 3 piece bathroom and comes with a daybed that can pullout and be used as another twin or can convert to a king bed. 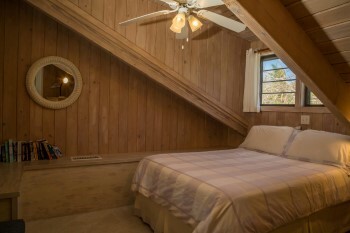 Features a Queen size bed, seating area and connects to a 3 piece bathroom. The room opens to a deck overlooking the sea. 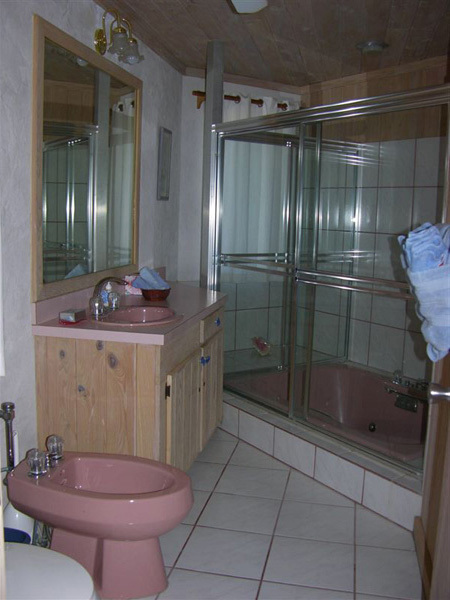 Partial view, 6 piece bath with 2 sinks, bidet and Jacuzzi. Partial views of the 2 dormer bedrooms - each shares a 3 piece bath on the same level, dresser and night stands, one is a queen and one a double bed. NEW Bathroom : A 4th bathroom has been added on the second floor. Cupola : room at the top of the house which affords a view for over 10 miles in all directions. Furnished with a sofa and love seat as well as stools at the wet bar. Satellite TV is included with over 70 video channels and the major Miami networks. A step out observation deck is off this room and the view is unbeatable. 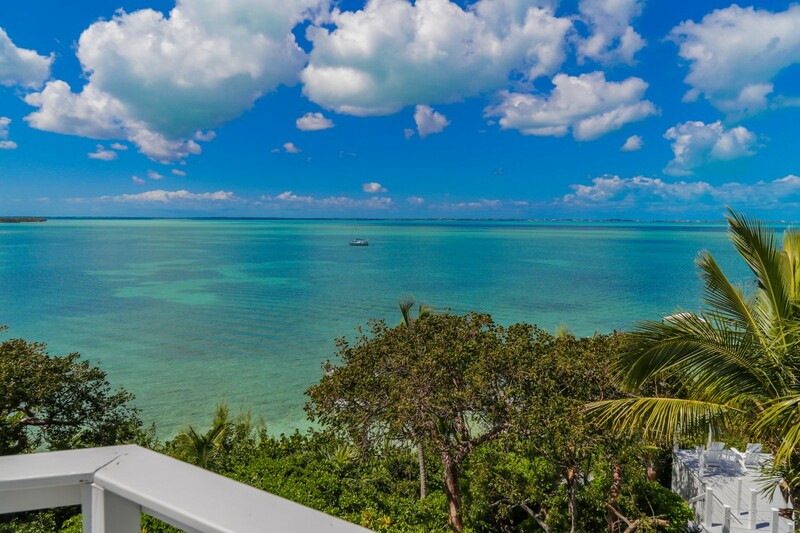 Views of the Sea of Abaco directly in front of house from the outside top deck of the cupola. Main deck with furniture - accessed from Great Room and Master and Guest bedrooms. View of generator building. The house has a standby 35KW generator and a desalination plant on the property. View from shower to Sea of Abaco. View of house from the back entrance into main hallway. 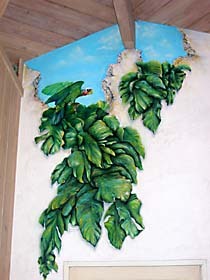 Trompe L'oeil artwork on main hallway by back entrance. Grounds : situated on a 2.2 acre estate with extensive native landscaping and orchards. Fruit trees include orange, tangerine, grapefruit and other citrus as well as banana, mango, papaya, carambola, pomegrante, avocado etc. Our guests are free to enjoy any fruit that is currently ripe. All prices are in US dollars and are on a weekly basis. Terms are one half payment on booking, balance due 90 days before arrival. In case of a cancellation, a full refund ( less a $100.00 administration fee) will be paid providing an alternate tenant can be found . Internet Access: Free access to Wi-Fi Internet is provided for all guests. Free access is also provided to our VoIP phone, which allows free long-distance calls to the US and Canada. Just make sure you bring a Wi-Fi enabled laptop or other device. Food: There are several larger grocery supermarkets in Marsh Harbour and it is advisable to do a main shopping there especially if your stay is 2 weeks or longer as the prices are slightly better. Your cab driver will wait for you. There are several grocery stores on Elbow Cay, including Vernons, Harbour View and LVA. It is also advisable to do your main liquor shopping at the several stores in Marsh Harbour. There are 2 on our island, but the prices are higher than Marsh. Again, your cab driver will wait for you. Recommended Attire: Depending on the time of the year, you may want to bring a sweatshirt or sweater during the winter months. In general, you never wear half of what you bring — dress is very casual on the island, including dinner dress. Shopping: US currency and traveler's cheques are accepted everywhere. Most shops and restaurants accept credit cards. The house is fully equipped, including linens and bath towels. PLEASE BRING YOUR OWN BEACH TOWELS. A week is not enough time! Comforts of home, Beauty of paradise! Conched Out exceeded our expectations! This was our 3rd trip to the Abacos Islands, I doubt we will ever go to another resort again! 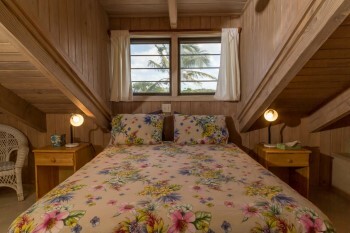 We just returned from a 2 week stay at Conched Out on Elbow Cay, a beautiful home owned by Don Harrower. Don is a great host, providing all the information and contacts for everything you would need, or activity you wanted to do. Hopetown, a quaint little town, is nearby, as well as several restaurants and shops. The setting is absolutely perfect, nested into the shoreline with a private dock where we kept our rental boat. We had 5 couples in total, so everyone had their own rooms, with a great room and kitchen area that looked out over the palm tree covered property to the water. 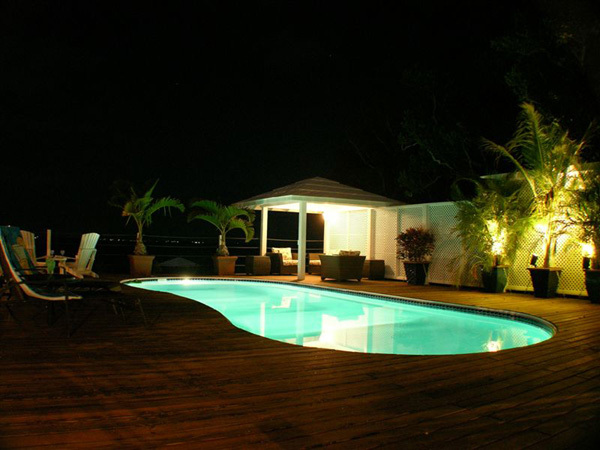 The group spent a lot of time at the pool, and cabana area that is built on the edge of hillside over looking the Abaco Bay. The house is well maintained with every amenity you could ask for. My favorite two things were the outdoor shower and the 3rd floor sitting room with awesome 360 degree views. This was the second time staying at Conched Out, and I am sure we will be back again! Conched Out is a fabulous place ! We had a fantastic vacation at Conched Out. The setting is spectacular! Besides the water views, it is surrounded by lush gardens and greenery. Loved jumping off the dock and swimming in the pool. The house has everything you need and the owner, Don, was so nice in assisting us with our questions and travel arrangements, etc. We feel so fortunate to have stayed there and highly recommend it. This was our families 4th trip to Conched-Out, and it once again our expectations were exceeded! The owners are such great ambassadors to the region, the local community and their home is absolutely gorgeous place to spend your time on Elbow. 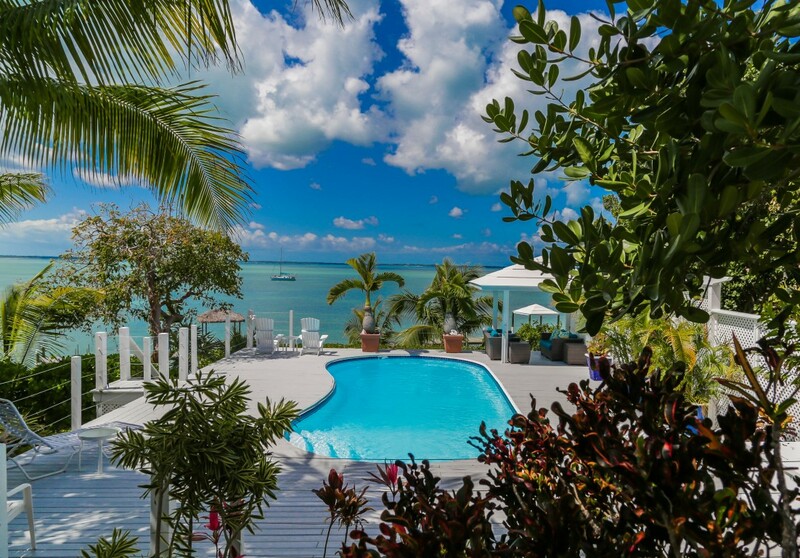 Wonderful dock, beautiful pool, every amenity you might need (our typical day is a boat ride, a beach, a lunch at on one of the Cay's or in Hopetown and then dinner in - we cooked 5 of the 6 nights this year). We had great fun popping over to Firefly for an afternoon drink and then heading back to our secluded retreat. Conched-Out accommodated our two families (total of 8) beautifully. Plenty of room to roam. The cupola offers some of the best views outside of the lighthouse and each night provided a 'cool place' for the kids to hang away from the adults. Highly recommend this wonderful property. We just finished our first stay at Conched Out and were very happy with our week there. Don was very responsive and easy to deal with and the house was just as advertised. His caretakers even delivered golf carts to the house at our arrival. 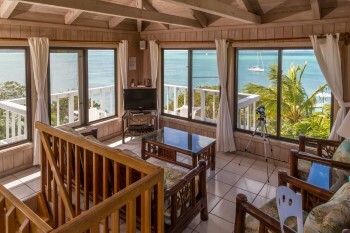 We selected the house because it had a number of unique features for the Elbow Cay area. It has a private boat dock where we kept our 31 foot catamaran with plenty of space and no issue with the waves. 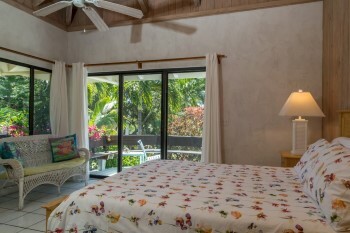 It has a very large pool for the abacos which is landscaped for complete privacy from the one neighbor next door. It has 5 bedrooms so our group of 5 adults and 5 kids had plenty of space. The pictures are nice but it was really nicer in person. It's centrally located on the south end of Elbow so golf carting or boating to just about everywhere on the island is very easy. Finally, didn't realize the generator was important, but it turned on multiple times the week we were there - and was seemless. We had air conditioning, lighting, hot water, etc. regardless of what anyone else on the island had. Really a great week and rental experience. Thanks Don. Just returned home this weekend from a stay at this incredible home with 9 other friends! The atmosphere is amazing and the views can't be beat!!! I can't say enough about this place! I know the 10 of us will be back for sure!!! So thankful that the owner chooses to share this gem so that lasting memories can be made! CS from SC - AWESOME! We spent a week at Conched Out with 4 adults and 4 children ages 9-15. The house and grounds are great, especially the pool and dock. Our entire crew was extremely comfortable in the home and it has ALL the conveniences you would expect. The location on the island is perfect for exploring Elbow and it is also convenient for exploring the out islands by boat. The owner is a pleasure to deal with and communication is top notch. Wish I could give this one 6 stars !! Harley, South FL - 10th Time Back! We've been traveling to the Abacos for over 15 years from South Florida. Once we found Conched Out, we've returned every year since. The house is always well maintained with new improvements every year. We love the central location by water to all the out islands (Man O War, Great Guana, Lubbers Quarters, etc. ), snorkeling, fishing, and, of course, all the unique island bars (Pete's Pub, Nippers, Grabbers, Lubber's Landing, Cracker P's) including those in Hopetown and on Elbow Cay. The house has every amenity and connectivity (if you want it!) and the Cupola on the third level is a great venue to watch sunsets or sunrises, view the stars at night, or just sit and look out at the Sea of Abaco and decompress. The pool is great for cooling off in the afternoon and the pool deck covered lounge area is my wife's "Peaceful Place" while the guys are out fishing! Coming back every year is the strongest recommendation I can give. I'm already planning my return in May 2017!! It took us 10 years but we made it back to Elbow Cay. We searched for months for the right house for our trip and are so glad we chose Conched Out. What a fabulous house. Not sure where to start. We came in by boat so our first look was walking up the fabulous walkway to the house. The grounds are very well kept and the foliage is all mature. Beautiful flowers everywhere. The pool was wonderful. We were there with 2 other couples...some were 'sun hounds' and some weren't. Lots of places for both. The house is very well stocked with everything you could want or need. The views were outstanding from every angle of the house and the sunsets......wow! We caught fish off the dock and saw rays swimming right there too. This house and amenities were great for 3 couples (parents and adult children with spouses). Numerous bathrooms provide lots of access when needed. Lots of room to get together or been on their own. (at the pool, in the copula, on the deck, on the dock. The pool is wonderful after snorkelling or just to cool off and visit. Marine life is plentiful. There seem to be regular morning turtle visitors offshore, tropical fish around the dock and the occasional wild dolphin every other day. Great for young adults because Hopetown and White Sound are readily accessible by golf cart ,walking or boat (for mariners) to maximize things to do for young adults. Other islands (Man of War, Greater Abaco, etc.) are easily reached on a day boat trip. The driveway is long enough that one doesn't hear traffic sounds on the Queeen's Highway. Wonderful views from the deck, pool, dock and copula. Not much gets by on the Sea of Abaco without being seen from somewhere. 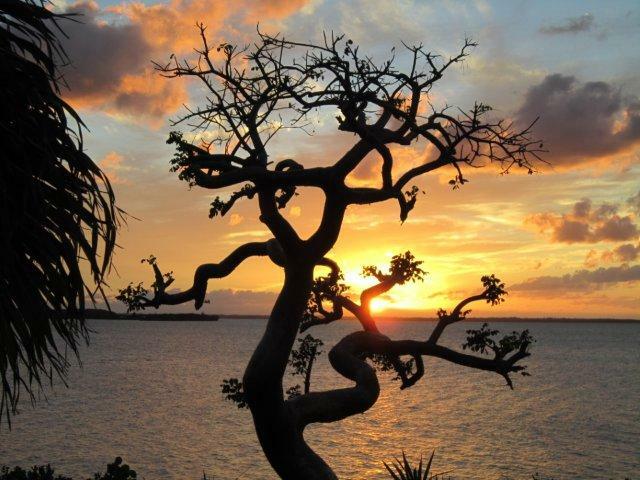 Gorgeous sunsets over Greater Abaco Island. Miss Terri Jupiter FL, Beyond Fabulous week at Conched out! What a beyond fabulous stay at Conched Out! First the thoughtfulness of the homeowner, checking out seas for us as we were running boat over from Florida for the week. Great dock to accommodate our boat. The location is spectacular and the views picture perfect. Sherman and Wilma, the caretakers of the house could not have been any better! Golf carts waiting upon arrival and anything we needed at our becon call! One of our guests left a cell phone and they went above and beyond to ship it back to the states at no charge. The kitchen was one of the most equipped kitchens we have ever had from dishes, pots and pans, spices and general supplies. Also, so lovely having a beautiful pool at the home. Also, a complete and thorough list of any instructions for home provided, restaurant recs, shopping and activities etc. you covered it all and we can't thank you enough! Jaquelin P, great Spot on Elbow Cay! My family has just returned from a wonderful week at Conched Out. The house could not be more perfect for a family group, including either adults or children. 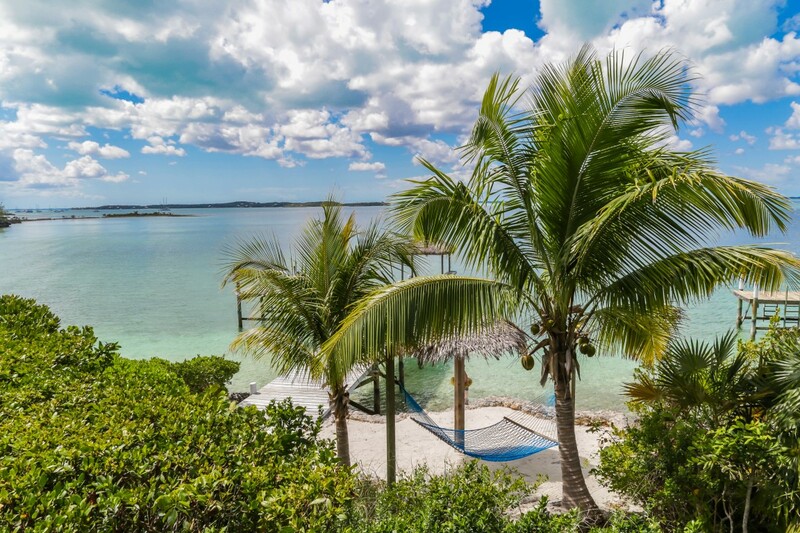 All your needs for an Abaco vacation are right there, including a wonderful pool and deck area, convenient dock for your boat rental, and easy access to any of the local destinations. 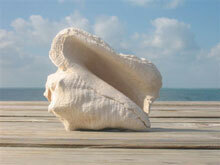 White Sound destinations are a quick walk or golf cart ride away, and Hopetown is easy by boat or golf cart. A small grocery store is nearby if you don't want to go into Hopetown. 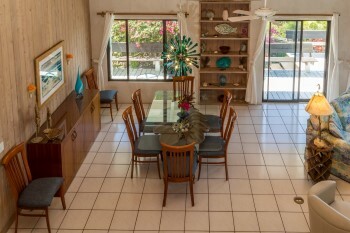 The house is comfortable and well equipped, with plenty of room to spread out. The kitchen is up to date with all the comforts of home, and I can't say enough about the beautiful views from every spot. 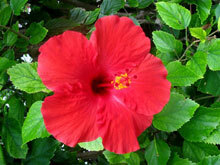 The owner of the house, as well as the care takers on the island were helpful and easy to communicate with. We swam right off the dock as much as we used the pool. It was a perfect week in a perfect spot. Thank you so much, Don! Speaking of which - Wilma and Sherman are TOP rate caretakers. Always and easily available. One time we ran out of gas in one of the golf carts, left it by the side of the road only to come back and find it gone ! We go the house and lo and behold there was the golf car tin the driveway filled with gas ! Thanks to you Sherman ! Don Harrower is a DELIGHT to deal with. Efficient, nice guy, who clearly has affection for not only Conched out by Hopetown as well. This coming April 2016 marks our third year and 6th week staying at Conched Out. If that doesn't tell you a little something something right there ! Would we recommend this house? Only if you love stunning sunsets, a great pool, great dock, easy access to well, everything, and of course more than a bit of WOW. Great Spot on Elbow Cay! Our group was two families of four sharing the home. Renting the home was easy as Don was a pleasure to work with throughout the process, and after the house was booked, even helped us with arranging golf carts, etc..., before arrival. We rented a boat which we were able to keep at the private dock for Conched Out,which was super convenient. When we weren't out on the boat for day trips exploring secluded beaches and snorkeling, we spent lots of time swimming and hanging out on the dock. There is even a little snorkeling nearby, and Spotted Rays and even the odd turtle made regular passes in the calm late mornings. Both the pool deck and the dock were great places to spend the late afternoons and enjoy sunsets. The house was well equipped with everything we needed, and the caretakers Sherman and Wilma took good care of us when we arrived. We didn't really need much help during our stay since the house was pretty self sufficient and easy to figure out. We loved the home and hope to return soon. John, Birmingham AL, Spring Break! Great vacation. Two families with young children and we had a blast. The house is well equipped for cooking and the pool was huge plus. I highly recommend for families looking for a great experience in the Abaco's. This was our second stay at Conched Out and our first with our 6 month old grandson. He loved the high chair and crib provided by the owner as part of the accommodations. The home has everything you could need and more. Plenty of dishes pots and pans etc. to make the kitchen a great place to prepare a meal. Elbow Cay is one of our favorite places to relax, and owner Don Harrower and the caretakers do everything to make that possible. 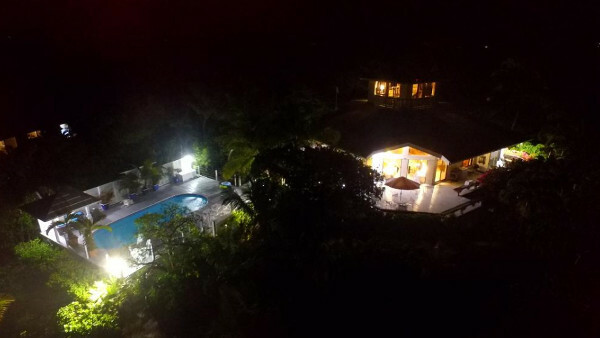 Elbow Cay and the surrounding islands are absolutely beautiful and Conched Out with its large spaces, fantastic views, pool and well landscaped gardens is too! 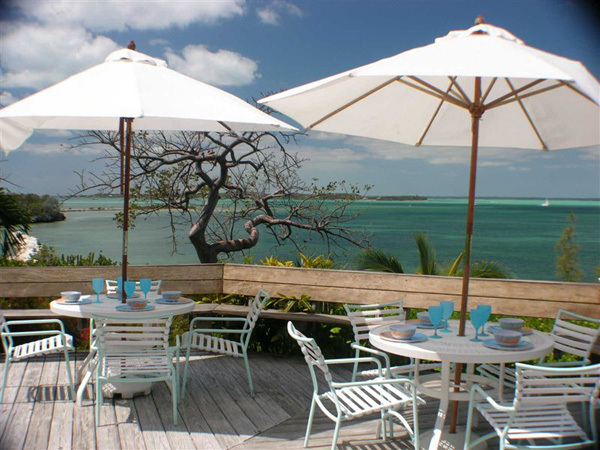 Have stayed before and would not consider any other location in the Abaco's. Owner was great to work with, was responsive to our questions and the recommendations for all our needs, like cart, boats, groceries etc were spot on. It was a birthday week for one of my daughters so house was full. Comments: Grandma/Mom I think the serenity was all one could ask for. Every view from the house was a Garden of Eden on the Bay, with no other houses in sight. The nearby "boat-free snorkeling" was a big surprise and was perfect for a spur of the moment "snork". Whether we wanted companionship or quiet "Conched Out" has something for everyone. Birthday Girl The house is great for a large group – there are so many places to be that we never felt as though we were on top of each other. Having stayed before, the best thing about this visit was definitely the pool. We probably spent most of our outdoor time at the pool and with a covered area as well, there was plenty of space for everyone, no matter their sun desires. It’s clear that Don (and the caretakers Sherman and Wilma) take great pride in keeping the house well maintained and clean and are incredibly helpful in responding to any queries. Back to the bottom line!! Rent it. You can't go wrong!! Just got back from a week at this beautiful home. We were a family of 6 adults and 2 children under two. It was absolutely perfect in every way. It was the first time we have ever rented a home with a pool and now it will be a must! If we weren't in the boat, we were in the pool. The view was unbeatable. We have been to Elbow Cay several times and it is a great, relaxing island - and also the friendliest I have been to. If you are an architect and into wood, you will also totally appreciate this home (as my husband did)! My family of 5 (husband and 3 daughters 8-19) spent a blissful week at Conched Out. Where to begin? I guess from the moment you arrive (we did by boat thanks to the private dock) you can tell you are in a special place. Actually it starts even before you arrive as the owner Don Harrower could not be more helpful and accommodating. Even before we committed to his house he had given us valuable advice on flights, boat rental companies etc...and then once we booked he lined us up with his delightful team of drivers and house managers who made every transition seemless and easy. This house has it all--literally. Private dock, swimming pool, breathtaking views and plenty of space. We were just our family, but there's more than enough room for a family reunion or 2 families -- making the price yet another positive. It's also right next door to the best restaurant on the island. The house was impeccably clean and the perfect place to begin and end every day. At the risk of competing with another family some day, we cannot recommend Conched Out enough! Conched Out was the perfect house for us! This is our third visit to Elbow Cay and Conched out was by far the BEST house we have stayed in. We had a total of 4 adults, 3 children and an infant and each one of us had an amazing vacation. The location, the pool, the cupola, the dock (perfect for a boat) kept everyone entertained. My boys loved reading about the owners dog Luke and his Abaco Adventures. Overall, a fantastic house and we highly recommend. All week, my 3 boys kept asking us "next year can we stay for 2 weeks"- I hope so! Thank you for opening up your home to us. Recommended for: Families with teenagers, girls getaway, families with young children, romantic getaway, adventure seekers. We spent 2 weeks celebrating my birthday with friends at the house and it could not have been better - the house is fabulous, the views are amazing and the island is the friendliest one we've visited to date. We will definitely be back over and over again! We echo the previous reviews on this expansive house rental. Aside from the large living area for all to gather there is a large deck and then a staircase to the pool with another big deck. The dock is a simple walk further and easy to get into the gorgeous sea for swimming and snorkeling. The landscaping is well done and the place is very private. We were glad it was just a quick drive to pick up grocery essentials, as we seemed to need them regularly. The five of our "20-somethings" adored the cupola and rarely allowed the "adults" into their private haven. All 11 of us were taken with Elbow Cay and the various restaurants and bars. Don Harrower is the most accommodating owner and provides all information you need. His music system is terrific and was in use non-stop. We highly recommend this home. From the day you reserve this property you will have a great experience! The owner is very responsive to emails and hands on in every aspect of the rental. He emailed several times prior to the trip, the night before we left and called us at Conched Out the day after we arrived to confirm that everything was ok. He had a golf cart at the house that the care taker of the house provides. (who is also fabulous). Matthew the driver that he recommended was dependable and helpful. The house is clean and gorgeous. We loved the large deck, outdoor shower, pool and dock. We appreciated having the grills, internet phone and WiFi available. You can't go wrong with this rental. We are already looking forward to our next stay at Conched Out. Recommended for: Girls getaway, adventure seekers, romantic getaway, families with young children, tourists without a car, families with teenagers. Exquisite experience on resort-like property! BEST VALUE ON THE CAY! We looked at many cheaper places, but Conched Out worked out to be the best house we have ever rented in all of the Carribean! Don (the owner) takes great pride in providing all of the amenities you need to have a relaxing stay and enjoy the island life. He is engaged and very helpful to provide hints and contacts to meet all of your vacation needs (from boat, to golf cart, to car transfer service, to excellent hints about the best food and services in the area!). All of the spaces are roomy and well appointed. A pool is a must have after the salty sea and Conched Out's is perfect, you will regret not having a pool if you rent elsewhere! The pool deck is nicely sized for a large group and the gazebo is fantastic, especially with the speaker system! There is another deck that surrounds the house on three sides and provides great spread-out space with an outdoor shower to wash you and your scuba gear! There are 2 grills (propane and coal) to cook with for you freshly caught fish! The generator is great and we needed it several times, thankful for it as power was out for several hours once. Nice snorkeling right off the private dock and the private beach with the hammock is a cozy nap site! There is plenty of space for everyone to spread out across the property so each can find their private oasis and some quiet time even after days together. Even if your party fills all of the beds, there is plenty of room for everyone to sit, cook, eat, get clean and enjoy the outside spaces. No chance of feeling confined at this property. There is a property next door which shares the driveway, but it is well positioned away and behind foliage and you will enjoy complete privacy whether at the pool, beach, or the expansive deck! Conched Out is the finest estate we have rented and created great memories for our family! 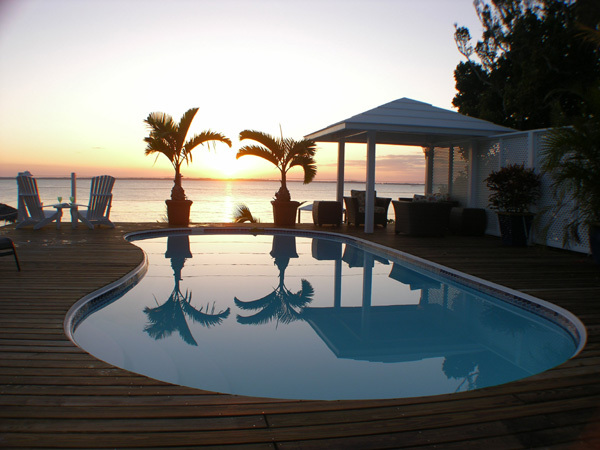 The little extra you spend for this property will enhance you vacation immensely, especially after going through the effort and expense of getting to Abaco, you can truly relax and enjoy your time at Conched Out. Don is a thoughtful owner so your stay will always be fantastic!! Use Don's recommended car service upon arrival to get groceries and booze before going to your boat. Cheap and easy! We landed at 4 and were in Conched Out by 5:15 with food and drink. You will also save substantially. The LVA is the only "store" open on Sunday, FYI. Golf cart will be at the property rented from the caretaker = easy. Recommended for: Romantic getaway, families with young children, families with teenagers, girls getaway, adventure seekers, sightseeing, tourists without a car, age 55+. Conched Out has ALL the amenities needed for a great family reunion; we just returned from our one week vacation in total paradise. Our family of 10 (including my two kids ages 5 & 8) had plenty of space on this large property. The open floor plan and wrap around deck provided a perfect view of the ocean and lush landscaping from anywhere in the house. We spent a lot of time in the pool, listening to music from our own MP3 through the poolside speakers. The owner (Don) was fantastic about answering questions and providing guidance on renting a personal ferry to deliver us from Marsh Harbour to the Conched Out dock, as well as info on golf carts, boats, dinners, taxi, grocery store and more. We rented a boat for three of the days and were able to keep it right out back. Great for quick trips to Tahiti Beach or the Lighthouse with the kids, or to Cracker P’s, Lubbers Landing, or Pete’s Pub for the big kids. The home is equipped with a great WiFi system, washer/dryer, internet phone, Dish TV, 2 outside showers, gas grill, plenty of kitchen utensils, and so much more. A truly great experience! Recommended for: Romantic getaway, families with young children, families with teenagers, sightseeing. Just returned from our first stay at Conched Out and couldn't be more pleased. The home is absolutely lovely and comfortable. The website pictures are very accurate and definitely depict the beauty of the home and fantastic location. It is breathtaking to behold! The caretakers, Wilma and Sherman, were always helpful, having 2-4 seater golf carts waiting for us as we got off the ferry. We were 6 adults,1-15 year old boy, and 4 and 6 year old girls. The teenager and the girls especially loved the cupola as did we all. We also enjoyed the pool, the huge deck, the dock and the beautiful grounds. Our granddaughters spent a great deal of time building sandcastles on the beach - what a fun time for all!! We had rented a boat for the week and it was great being able to tie up at the dock. We enjoyed several meals at Fire Fly which is practically next door. There are many enjoyable eating spots and we tried as many as possible. Most importantly, the owner is so very helpful, answering questions and offering hints to make our stay as enjoyable as possible. We are so appreciative that he and his family are so willing to open their home to strangers. The opportunity to enjoy such a wonderful environment is something no one in our family will ever forget!!! Recommended for: Families with young children, age 55+, romantic getaway, families with teenagers, girls getaway, adventure seekers, sightseeing. We have just returned from our second stay at this amazing property. We arrived by rental boat (Water Ways is great boat provider) to the private dock. The caretakers arranged for golf carts to be delivered right to the house. I can't say enough about the house, gardens, and pool but here goes... The main entertaining area is a huge open concept to kitchen and dining. The vaulted ceilings create a sense of space that lifts the cares of the world off my shoulders. 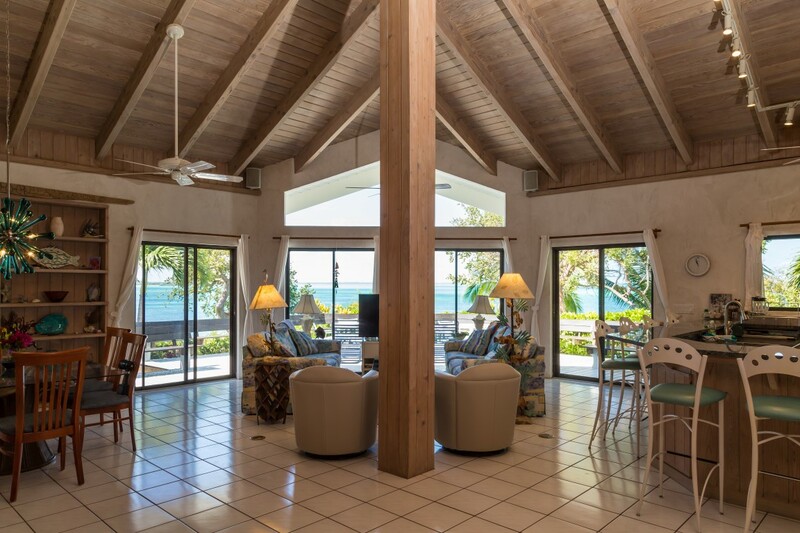 The views from the dining area, kitchen and entertainment space are all of the lush tropical vegetation with the turquoise blue Sea of Abaco. The wrap around windows and doors allow the spectacular view to flood into the house. Step out onto a wraparound deck that now features a delightful outdoor shower. 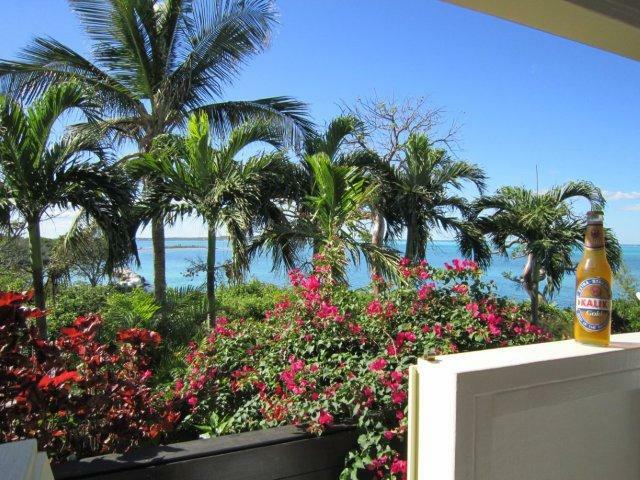 I loved being able to shower while gazing at the lush gardens, ocean and listening to the birds sing. Sitting on the deck watching the sunset with a cocktail is perfection. The pool is another favorite area for my family. The cabana is a shady spot to hang out and read a book while the breezes waft by. It is also wired for sound which the music lovers in my family really enjoyed at the end of busy days. There is so much space that everyone could find their own quiet retreat when needed. The ocean is crystal clear and our kids spent many hours snorkeling right off the dock and saw lots of fish and sea life. Get out of the ocean and fresh water showers are right there to take the salt off. There are many good restaurants nearby, which also offer live music, to keep you well fed or entertained if you don't feel like cooking in their spacious kitchen. We ate, drank and danced at many of them. The island is charming and friendly. Conched Out is a wonderful property that everyone in our family would recommend. Thank you to the Harrower family for sharing your wonderful place with us. Conched Out is paradise! 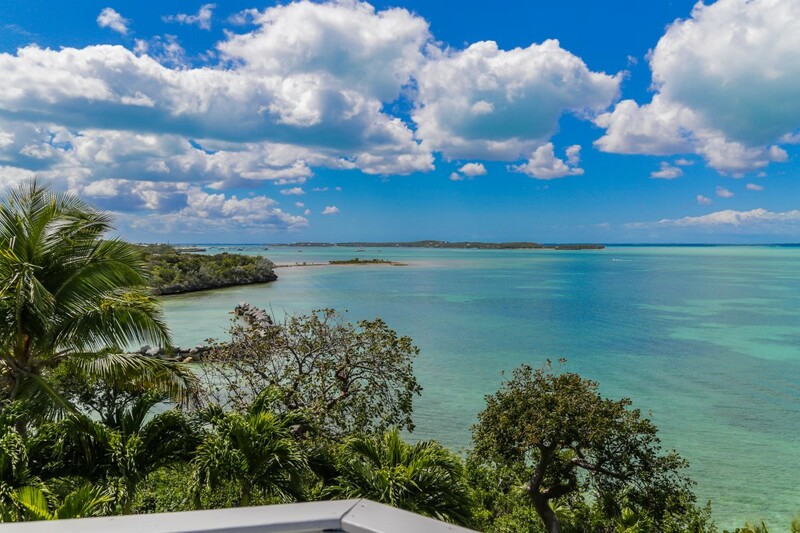 Our family enjoyed two weeks at this beautiful property in the summer of 2012...spectualar views of the Sea of Abaco, ideal location on Elbow Cay and a house with everything you need to relax and enjoy! The owners are a pleasure to work with as well as the on sight caretakers. The proerty is beautifully maintained and kept up to date. We have been to the Abacos before but it was our first stay at Conched Out... hopefully not our last. Boat and golf carts are recommeneded to fully enjoy the beauty of The Abacos. The owner can provide great recommendations for both. Recommended for: Adventure seekers, families with teenagers, tourists without a car, romantic getaway. Conched Out: A great place for total relaxation! We have been to Conched Out three times so far and will be back. We are a group of 7 adults; the house is so spacious we can all spread out around the house, decks, pool and cupola or we can all be gathered in the main living room comfortably. The grounds around the house are very well maintained as well as the pool area; bring your iPod to plug into the speaker system by the pool! Just about every night you will be treated to a beautiful sunset; we usually do not go inside until the sun is setting :) At night you will want to check out the little deck off the cupola - a sea of stars will greet you. 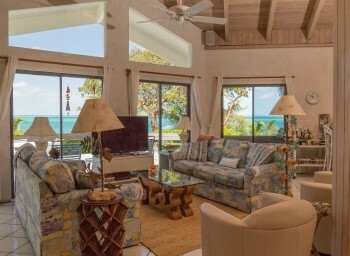 The website does a great job giving the details of the house and the island of Elbow Cay and if you rent the house any questions that are not answered by the website will be answered in detail by the owner. The owner is so helpful and friendly; he will answer your email questions promptly and will give you great advice on anything Elbow Cay. We bring our laptops and iPads so we can stay connected with older parents and children back in MA; the system in place is the best. It is very comforting for us to know we can check in with home without having to worry about cell phones. We have rented a boat for the week each year we have gone - same boat each time; highly recommend Water Ways boat rentals on Man-O-War. There are tons of great places to go; we love to island hop around the Sea of Abaco - excellent snorkeling. I think we have eaten at just about every spot on Elbow Cay; a new addition close by is Fire Fly, a great spot to stop and get a drink at the end of a day of boating. The caretakers of Conched Out rent golf carts at great rates - the was real handy. Just remember as you drive around the island that most of the locals walk back forth to Hopetown - we have given quite a few rides when we have an open seat - the kids appreciate the rides home from school! This year someone was flagged down by an older women to get a ride to church; part of the way to town she realized she forgot her glasses; they turned around, got the glasses and delivered her to church on time! I highly recommend Conched Out for your stay on Elbow Cay, although I hate to share the spot with the rest of the world, don't want my favorite vacation spot to get too crowded :) You will love the place! Our family of four spent a week at the Harrower family's amazing Conched Out home in both July of 2008 and August of 2009. It was perfect both times and we can't wait to go back. Don Harrower was so easy to work with for both of our trips and his property is well taken care of and full of nice touches. What we probably loved most was that we could dock our rental boat right at the house, and the beautiful pool. Snorkeling right at the private dock is a great activity with lots of fish to look at. So is fishing from the dock for the little ones(my 6-year-old caught a small barracuda and some other colorful fish). We rented a front-facing four-person golf cart from the housekeeper Sherman and his wife for getting around the island and it couldn't have been easier-the cart was waiting for us when we arrived.Hanging out by the pool day and night with Jimmy Buffet playing from the pool speakers was simply amazing. The house itself is very large and spacious, way too big for our family of four but I wouldn't consider staying anywhere else because of the pool and dock. 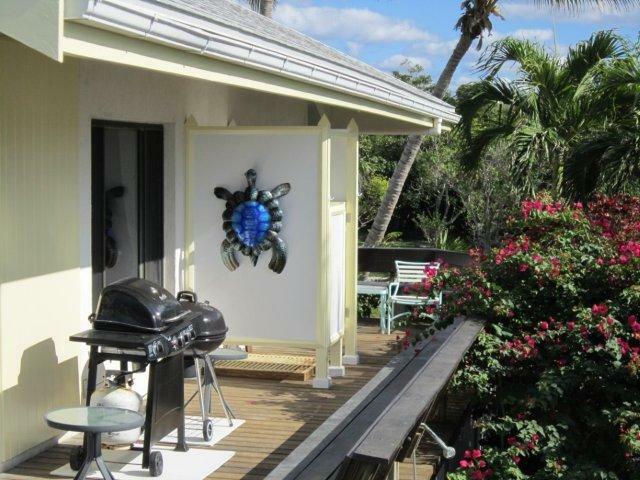 Overall the house is very comfortable, situated in a perfect spot on the west side of Elbow Cay, and the deck and views from the cupola are fantastic. My family always talks about our trips to the Harrower's amazing house and we really can't wait to go back. Rent a boat and dock behind this amazing home. We celebrated my husband 40th birthday and invited family member to join us. This home is very comfortable, the yard provides so much privacy and peacefulness. The views are spectacular, sunset we had never seen before and we live in Hawaii ! Conched Out is a great home--we had everything we needed and more. The pool is fabulous and the western view is amazing. There was ample room for 2 families to relax and enjoy. Internet access was helpful! The house is perfectly located--close enough to town to enjoy an ice cream yet far enough away to feel that you are on the island by yourself. We rode bikes and took golf carts all over the island. The owners are detail oriented--and work hard to make sure you have all the information you need. The people of Elbow Cay are gracious, friendly, and welcoming. We stayed for one week, and it simply wasn't long enough. Thank you for a fabulous vacation. Recommended for: Adventure seekers, age 55+, families with teenagers, families with young children, girls getaway, tourists without a car, romantic getaway. Our family loves Conched-Out! We have stayed in Elbow Cay four times, with the last two being at Conched-Out. It is by far our favorite place to stay, and we plan on returning as soon as possible. Now that we know what the best is, we refuse to stay anywhere other than Conched-Out. We have 3 boys ranging in age from 14 to 16 and they think Conched-Out is terrific. I love that the house is spacious enough that everyone has their own space. If the boys aren't outside snorkeling around the dock and surrounding area, I can always find them hanging out in the Cupola. An added bonus is the fact that the boys can stay connected to their friends at home, and my husband and I can stay connected to work if necessary. The sunsets are the best on the island and the property is so amazing it is hard to leave to explore the rest of the island! 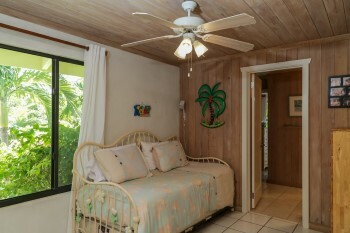 If you are looking for a peaceful get-away with no worries, Conched-Out is your destination on Elbow Cay. We highly recommend this beautiful home for your vacation stay. Recommended for: Families with teenagers, families with young children, romantic getaway, sightseeing. We have stayed at "Conched Out" twice and look forward to returning again and again! Location is perfect for exploring the beauty of Abaco Islands . 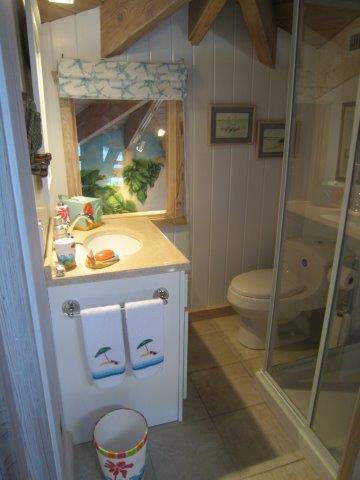 The house is a very convenient boat trip from Marsh Harbor and is loaded with amenities. Snorkel from the private dock, lounge by the pool, enjoy happy hour cocktails in the cupola or read on the sandy beach - pure paradise! Recommended for: Adventure seekers, age 55+, families with teenagers, girls getaway, tourists without a car, romantic getaway, sightseeing. Our family stayed here in '07. Very comfortable house with all the amenities and big enough for a couple of families to share. Fantastic dock and backyard area. Very private. Definitely recommend for your Hope Town stay!! Recommended for: Families with teenagers, families with young children, tourists without a car. Conched-Out has become our destination of choice in Elbow Cay. 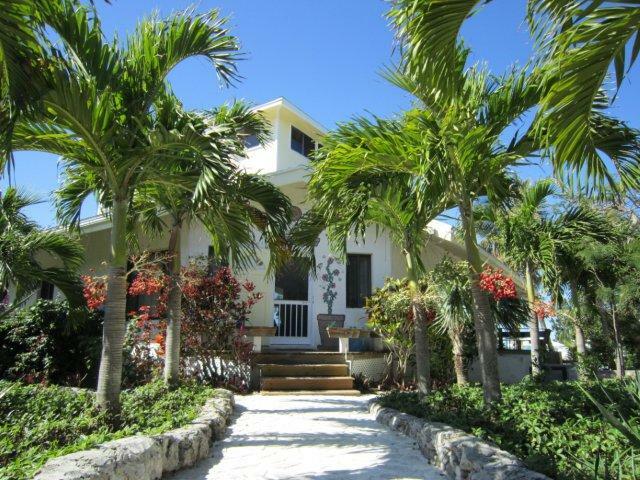 A wonderfully appointed property that is comfortable for 'doing it all in Abaco'. Un-paralleled vistas, phenomenal pool, perfect access for golf cart adventures into town and an ideal docking location for the rental boat. Conched-Out gives you the opportunity to launch for Lubbers, Tahiti Beach, Little Harbour, Tiloo Cut, Johnny's Cay, Hopetown, Guena Cay, etc. On less than perfect boating days a trip to town for lunch or a bit of shopping is easy. Of course, the property and home themselves are truly wonderful, so simply sitting around the pool or exploring the generous grounds is fun too. The Owners and caretakers are responsive and earnest in their efforts to assure a memorable experience. Conched-Out has all the amenities you'd expect in the kitchen, home entertainment and general comfort. We have small children and travel with another family. The kids have plenty to do and the various decks, hang out areas and amazingly fun Cupola room (where apparently the children have found a fairy princess) give us the space we need when inside. Book this home with confidence. You will make wonderful memories and more than likely, like us, will count down the days to return to make more! Recommended for: Adventure seekers, families with teenagers, families with young children, romantic getaway. We have stayed in Conched Out a couple of times. We stayed in the home before the additions were constructed. We thought then, it was a unique property and thoroughly enjoyed our stay. Now that the updates have been completed, it is even more of a destination for us. 1. The location on the island is ideal. A quick boat ride or cart ride into town or to White Sound worked well for us. 2. The location in the Abacos. Access to the Atlantic via Tillo Cut is very close and the central location makes it shorter south to Little Harbor or north to Guana or Treasure. 3. The home situated away from town makes it a very quiet spot and if you cut off all the lights in the home you can see every star clearly. 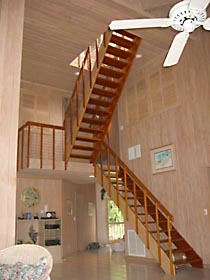 The multiple decks make viewing from the home ideal. 4. If you are not boating for the day, the home is a vacation in itself. The pool and gazebo with music outside make it a great stay at home spot. The kids can snorkel right off the manmade beach. The lee side of the island really shields you from the wind. We highly recommend conched out, have been multiple times and are trying to schedule our next visit for mid 2012. Recommended for: Families with young children, tourists without a car, romantic getaway, sightseeing. 2012 will be our 6th year in a row! Our tropical paradise, or as my wife would say, her "Peaceful Place"! Great central location for island hopping to Man O War, Guana Cay (home of Nipper's and Grabbers), Lubber's Quarters, Little Harbour (home of Pete's Pub & Gallery), etc. Great snorkeling (greatest reefs in the world) and fishing within minutes. Golf cart accessible island with good food, good "watering holes", great beaches, and charming colonial settlement. The pool and pool deck was built at the house after our first year, and while I didn't think we needed it, it is a great addition to sit out and enjoy the sunsets with a cocktail, and cool off after a day on the water. The house has all the comforts (and connectiblity if you want it!) of home, including an automatic generator, which is important in the islands! Conched Out is truly a great place to spend a relaxing vacation away from crowds and traffic jams and settle into "Island Time". We come by boat from South Florida and rent a golf cart for our stay, but boat rentals are available and Sherman (the house caretaker) has carts for rent. Recommended for: Adventure seekers, age 55+, families with teenagers, families with young children, romantic getaway, sightseeing. We visited Conched out for Spring Break 2011 and can't wait to return! Don was wonderful about providing tips and making himself available for questions on visiting the island. The home was huge and has a comfy island vibe. Upon arrival the property care takers were incredibly helpful including shuttling us from the dock with our own golf cart for the week! We brought our teenage daughter and her best friend who had a blast in the pool (w/outdoor music system) and touring around the island. We never had to worry about the girls as this is a true family vacation escape and not your typical Spring Break destination. We rented a boat and kept it docked at the house. It was great to just walk out the door and jump in to the boat for the day! The house was very well equipped and perfectly situated at the middle of the island, so everything was close and accessible. Great food, great drink and missing the sunset view from the pool deck. Can't wait to return! Recommended for: Adventure seekers, families with teenagers, families with young children, tourists without a car, sightseeing. 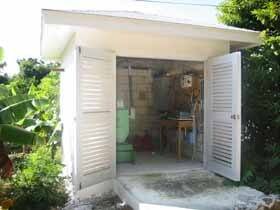 We have rented homes on Elbow Cay numerous times over the years. This one is tops. Everything about it is perfect, and the pool is a stunner! The owners are terrific people and really care about their guests. 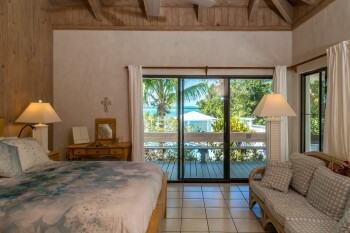 We HIGHLY recommend Elbow Cay, and especially this house! This property is absolute paradise. There was more than enough room for our 2 families. The pool and private dock were both a big plus. The owner was extremely helpful during the rental process, along with information once we arrived on the island. We would most definitely recommend this property to future renters. We can't wait to book our next 2013 getaway at conched out. Recommended for: Adventure seekers, age 55+, families with teenagers, families with young children, girls getaway, tourists without a car, romantic getaway, sightseeing.